What do Savremena International School students and their parents say? In all honesty, I am beyond impressed with Savremena International School. Savremena International School offers everything a caring parent would want for their child. This school is an ideal choice because it will prepare my son for the future and enable him to continue his studies abroad in the best possible way. The fact that he is able to improve his English skills is just superb. Savremena International School is unlike any other school. It has met all of my expectations and hopes of my son receiving a truly high-quality education. He is especially excited about what the Cambridge programme offers and it will be great for his future. In all honesty, I am beyond impressed with Savremena International School. At Savremena International School, everyone is supportive of my sporting activities. Savremena International school supports us in all our extracurricular activities, whether we are interested in art, dancing, sports, etc. I am a competitive swimmer so it’s very important for me to have teachers who understand that kind of regimen and help me reach my full potential instead of making sports interfere with my education or the other way around. The second you walk into Savremena International School, you immediately sense the different atmosphere and approach; a teacher is so much more than just an educator - they are mentors who know, understand and support us in every possible way. What I like the most about this school is the fact that everything is done in a different and interesting way. It’s like we’re in a film, but learning. I was amazed to find out that the student-teacher dynamic is very different from what we are used to. Teachers are truly committed to their students. As an athlete, I think it’s very important that this school promotes various extracurricular activities and that it nurtures the interests of every single student. This is the best school that I know of and I am quite thrilled. The new technologies used at Savremena International School are extremely useful as they offer a new and improved way of learning. I also like the fact that my peers are a versatile group. Everyone has different interests and activities that they pursue and I like that a lot. What I really like about Savremena International School is the individual approach to each student and that, through practical exercises and conversations, mentors truly get to know their students. At this school, teachers carefully nurture the interests of each student and guide them towards achieving the task at hand, making sure it is always done in a way that suits the student’s interests and characteristics. I expect Savremena International School to open my son’s mind to new perspectives and broaden his horizons. I expect him to find his path on his own in higher education. The knowledge offered at Savremena International School is highly practical and when implemented, it is sure to make my son’s life, further education and work much easier. I am proud to be a part of Savremena International School. I believe that Savremena International School is truly different. I will go to school with a smile on my face, aiming to learn as much as I can, knowing that I am not there to simply be quizzed, reminded of or reprimanded for my shortcomings, but to improve. A major advantage for me is the possibility of following the learning materials online, which is especially handy since I will occasionally have to miss some lessons due to sports - golf, to be precise. It will be an interesting experience. I like the way the classrooms are set up and the fact that the school implements new technologies in its teaching methods. I am proud to be a part of Savremena International School. When I walk into Savremena, I feel like I’ve walked into a school in the US. I lived there for a long time and the fact that I will be able to continue my studies there once I graduate from Savremena is one of the main reasons why I opted for this school. What drew me the most is the fact that it is the only school of its kind, not only in Serbia but in the region as well. Everyone is very nice and helpful, the overall atmosphere is lovely and the degree of commitment teachers and administrators show to their students is obvious immediately. My peers tend to think of school as a prison, but Savremena could not be further from that. I’m sure that we will all truly enjoy our time here. Savremena International School makes it easier for them to enrol at a university abroad. Savremena International School offers a programme that is perfect for students like my daughter, who has received the majority of her education abroad, with only two years spent at a Serbian primary school following a system to which she simply could not adapt. The reason we chose the Cambridge programme is because of the English-mediated lessons which will prepare her to enrol into universities abroad. This school enables students for a seamless transition into the final year at a secondary school in the US, most of which follow a curriculum that is just like the one at Savremena. From its classrooms to its teaching approach and its individual mentoring, Savremena International School is modern in every way. I believe that the Cambridge programme offers our children something that other secondary schools cannot. Savremena International School is the right school for me. When my family and I were considering the various options, we realised that Savremena International School is the best school for me. What I like the most about it is that for some of my subjects the language of instruction is English, which will enable me to refine my language skills. I really like the way the system is set up here - after lessons, students can stay at school and do their homework or attend study sessions with their teachers, which is something that my peers and I greatly appreciate. Another advantage is the fact that Savremena doesn’t use conventional blackboards, but interactive whiteboards, tablets and laptops as learning aids. It’s not called Savremena - which means modern in Serbian - for nothing. Everything is innovative and student-centred. I prefer Savremena over other schools because of its unique teaching approach and because the Cambridge programme enables me to continue my studies abroad. Everything is innovative and modern and the latest educational trends are implemented. The education at Savremena is more practical than at other schools and the teaching methods are different, more relatable and readily available. The atmosphere is very pleasant and classes are student-centred. I decided to enrol into Savremena International School because I liked the programme they offer, its interior and surroundings, as well as their teachers. The teaching is unlike anything offered at other schools in Serbia; it is at a completely different level. I believe that Savremena is the only school of its kind, not only in Belgrade but in Serbia as well. The scale on which they implement new technologies is simply beyond compare and teachers are fully committed to their students. Savremena International School is everything I wanted for my child. Savremena Gimnazija is something that I always wanted for my child - a school where everything would be something new, different, innovative. A major advantage of this school is its bilingual Cambridge programme that prepares students for studies not only in Europe but across the world, which has been a dream shared by our family for quite some time. I believe that Savremena International School truly listens to the needs of its students, recognises the demands of society, knows how to plant the seeds of knowledge into each student by using modern technologies and visual presentations, thus making sure that that knowledge is retained and applied in the long run. Given that the groups are much smaller than in state schools, each student has the opportunity to raise any questions or concerns they may be having and receive an answer without delay. The main reason why I decided to enrol into Savremena International School was because it enabled me to study only the subjects that interest me, unlike other schools in the region where students do not have the same kind of freedom.The cheerfulness and kindness of Savremena’s teachers and staff as well as their readiness to assist students also helped to draw me in. In addition, what makes Savremena truly stand out is the fact that it keeps up with the times - which is essential for the future sucess and development of its students. Since I am currently a DL student, the Cambridge Advantage Programme enables me to keep up with my classes and complete tests online with the help of the Distance Learning platform. I can’t wait to join my peers and start attending classes in person. All in all, I am quite pleased with this form of education and the school itself and I wouldn’t change a single thing. Teaching at Savremena International School is creative. Savremena International School, as the name suggests, follows a modern curriculum. I also like the specific approach to athletes who, like me, oftentimes have to miss classes due to tournaments - in my case water polo. I’m delighted to see that Savremena uses tablets and laptops in teaching and I look forward to receiving a comprehensive education in a creative and interesting way. I like the fact that at my programme - the Cambridge programme - all lessons are in English; it will be much easier for me, because I lived in the US for a long time. English is my first language, so the fact that I can speak English all the time at school is amazing; I am thrilled. I believe that Savremena International School is the right school for me because it clears the path towards a brighter future; we can learn things we would not learn at other schools. I also like the fact that we use computers, like we did in the US. Once I graduate, I will be able to attend one of the better universities and will also have more job opportunities due to my education. 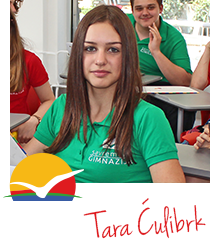 I’m overjoyed about being a student at Savremena International School. What immediately drew me to Savremena International School was the possibility of attending English-mediated lessons, which will ultimately enable me to continue my studies at a university abroad. With that in mind, I opted for the Cambridge programme, with the aim of perfecting my language skills. Not even in my wildest dreams did I imagine that such a school exists in Serbia; I am overjoyed about being a student at such a school. Our children’s success is certain. I am truly thrilled and proud to be a parent of a student at Savremena International School. The first time I met with the school’s administrators to inquire about the admissions procedures, I recognised the sheer love, enthusiasm and professionalism they have for their work. I was impressed with their approach, their ideas and the way they work. So, such a thing does exist in our country, too! It does not take long to realise that this is exactly the kind of school you would want for every child. Creativity, modern technologies, high-quality education and, above all, a benevolent atmosphere are the things that make Savremena different. With such approach, the success of this school and our children is certain. Well done! I attend Savremena’s lessons from abroad. What I like about Savremena International School is the fact that it enables me to develop my knowledge and skills in the subjects that interest me. This unique system gives me the freedom to select the subjects I wish to pursue, unlike other schools which have a pre-determined list of subject for all students. In addition, I like that our teachers can devote their full attention to students since the classes consist of small groups. They are always happy to help and assist us with whatever we may need. Savremena International School is unique because the education it offers is truly modern. The Cambridge Advantage Programme enables me to attend lessons from Budapest and keep up with my peers and academic obligations by following the recorded lessons. Learning has become much easier and much more fun through the use of tablets, interactive whiteboards, recorded lessons etc. Savremena International School is great and I would recommend it to everyone! Savremena International School is great! I would highly recommend it because it is centred around a great concept, it includes various activities and helps students develop their personalities, find themselves and pursue their interests. My son is currently attending Year 10 at Savremena International School and I think that at his age, children are not yet fully aware of all the advantages they get to enjoy. I am sure that in the coming few years, the true values of students will come to light and that they will make use of all of the benefits and opportunities the school offers them. My daughter, however, is currently a Year 13 student at a different secondary school and she is more than aware of all the advantages Savremena provides for its students. That’s why she wishes that she too had the chance to enrol into Savremena and experience all the benefits first hand. It is great that Savremena has a well thought out programme that enables students to rely on themselves, their resourcefulness and their talents as well as their teachers and mentors. I am confident that in Years 12 and 13 Savremena will become an essential part of the students’ lives, one they will not wish to part with. I wish Savremena International School all the best, and above all many brilliant, kind, hard-working and happy students and teachers. May all your dreams and goals come true in the period to come, which I am sure they will since it has all been coming together perfectly thus far. In addition to these impressions, what Nikola's mother thinks about our school is best expressed through the New Year's card which is also the best gift our school could receive. Take a look at her answer to the question that is on every parent's mind.